There are many traditions that we have all come to recognise from weddings we have attended, from the bride tossing her bouquet to single female guests to wearing something old, new, borrowed and blue. Some western wedding customs are still so popular today that even the most nontraditional brides happily take part. Why tempt fate and start off your new marriage with anything other than good luck vibes? For example, while in the western world, it seems normal for the bride to wear a white bridal gown, to others, this is very strange. In some countries the bridal dress is very vibrant and full of color. So why are western brides so limited in their options? It is said to have started with Queen Victoria in 1840 when she donned a white dress in her marriage to Prince Albert. In her day, this was very controversial because the color white was associated with mourning. The tradition of carrying the bride over the threshold is not a new tradition, it dates back centuries and has a few different origins. One most common belief is that this ritual began in Medieval Europe, where many believed that a bride was extra vulnerable to evil spirits through the soles of her feet. To avoid bringing in any evil spirits, the groom carried the bride into their new home. Also, some ancient societies believed that the bride had to show that she was not at all crazy about leaving her father’s home, and so was dragged over the threshold to her groom’s house. But the ‘West’ doesn’t have a monopoly on such rituals, other parts of the world have their own beloved wedding customs and in this series, we’ll give you an idea of what’s happening beyond your backyard. If you’re particularly charmed by a certain custom, feel free to adopt it for your own “I dos” even if it’s outside your heritage. When it comes to love and weddings, there are no borders so lets take a look at what takes place in other countries around the world. Typically, a chicken or a sheep will be sacrificed near the bride on her wedding day by a close male relative of the groom. Then a brother, uncle, or father of the groom will smear some blood in the bride’s shoe. Traditional Albanian weddings are rather epic and begin seven days before the ceremonies (yes, more than one). The guests sing songs and dance characteristic dancing. It is like a big party that involves the whole village, or neighborhood. The wedding party of the bride is usually held on a Wednesday or Saturday with the groom’s wedding ceremony, one day after, on the Thursday or Sunday. It is still a tradition in Albania for the bride’s family to give the groom’s family a dowry. The tradition varies from region to region, but the dowry is composed of items like pillows, blankets, carpets, and pieces of furniture. The groom is also required to give the bride’s family money as a dowry payment and is expected to give the bride special gifts like clothing and jewelry. It is a strict Albanian tradition that only close family members are allowed to give material gifts to the bride and groom. It is expected that all other guests leave envelopes of money for the bride and groom. In certain regions of Albania it is tradition to attach the money to the bride and groom during the ceremonial wedding dance. At the wedding ceremony the guests are all seated first. Then the bride will appear and is seated at a “throne” in front. She wears an intricate wedding gown and is adorned with makeup, much jewelry and henna designs on her hands and feet. A little later the groom dressed in ornate but traditional clothing joins her and sits in his throne. A holy man conducts the ceremony and the bride and groom then walk out as husband and wife. The true wedding celebration then begins with guests partaking of the wedding meal served in buffet style. They are joined by the happy couple and their families and the feasting may go on for hours or in some cases for days. The bride is surrounded by well wishers happily shouting to her and at this point she is never alone, but has her own entourage. No one leaves the celebration until the bride and groom go off to a nearby room and consummate their marriage. The wedding ceremony usually takes place late in the day, around 9:00 pm. The couple walk down the aisle together with the groom’s mother, and bride’s father standing beside. There are no bridesmaids or best men, the priest blessing the rings and that’s it. Well, there’s the mother of all parties to get to, after all. Interestingly, Argentinean church ceremonies are not legally binding. A couple should have a civil marriage service, which is the legal solemnization, which usually takes place the day before a church ceremony. Many of the civil venues used for these were specially built in the 1900’s and can include beautiful parks and gardens for photographs to be taken afterwards. At the reception, the happy couple start the evening off with a waltz. Guests line up either side, men on one side, women on the other, and at some point, the couple will part and grab another dance partner. Argentinean brides have their own variation of the bridal garter game. The bride will in fact wear several garters and will give these away throughout the party to her single girlfriends. Want a glimpse of your future spouse? Chow down on salty bread. That’s what single Armenian men and women do. According to the custom, if you eat a slice of the high-sodium specialty (which must be prepared by a happily married middle-aged woman or your grandmother) you will hopefully dream about your husband, or wife-to-be. Let’s hear it for carb-loading! The Armenian wedding ceremony reaches its peak in the ritual of Crowning. Crowns worn by bride and groom are symbols of their own little kingdom or home. During the crowning the bride and groom face each other, the best man standing between them holding a cross over their heads. After the crowing there is a blessing of the common cup. The cup has little bit of wine it and the blessing is done in the memory of the marriage at Cana of Galilee where Christ was present. The wedding ceremony ends when the priest blesses the couple, asking Christ to “protect them under the shadow of thy holy and honourable cross in peace”. The white wedding dress has been traditional in Australia for many centuries and is still popular today, symbolizing hope and joy for the future. It is traditional in Australia to give the bride a groom a keepsake bible as a wedding gift. Marriage bibles are treasured family heirlooms and are often passed down from generation to generation. An Australian wedding ceremony might feature the tradition of a ‘unity bowl’. Guests are given stones and asked to hold them during the ceremony. At the end, guests place the stones in a decorative bowl that the couple will keep and display afterwards to remind them of the support and presence of their friends and family. An Australian wedding reception is likely to feature a wide range of music, everything from traditional English and American music to bagpipes and even the haunting melody of the Aboriginal didgeridoo. The practice of ‘fetching the bride’ is popular in almost all Austrian provinces. The bride is picked up on her wedding day from her parents’ home. Today, the custom has changed to the effect that most grooms fetch their future wives from home with their groomsmen. The groom is already running ahead with the decorated wedding car and traditionally also has the bride’s bouquet with him. Together with the bride this group proceeds to the registry office or church. In many areas of Austria this path does not lead directly to the destination. Friends and neighbors are waiting along the route to block the newlyweds off. The couple has to stop, get out and complete a given task. This includes, for example, sawing through a log together. Only after the newlyweds have successfully completed this operation can the journey be continued. After the official ceremony the ‘Agape’ heralds one of the more informal parts of the wedding celebration. Traditionally a snack is served now, called the Agape. This gives the couple time to breathe and they have the chance to chat with those wedding guests who are not invited to the evening entertainment. Guests can now congratulate the couple and present their gifts. If held in the traditional way, only bread, salt and wine may be served at the Agape. This is due to the significance of the term “agape” in Catholic and Protestant faith, where it represents a meal together during a church service. Especially in Carinthia and Upper Austria great value is still placed on this tradition. The auction of the bridal shoe is very popular in Austria. It helps to fill the newlyweds’ purse. Like at a real auction all wedding guests bid on the shoe. The custom stipulates, however, that the final bid is made by the father, best man or groom. Only with a purchased shoe can he uphold the honor of his daughter or wife. It was once customary for the bride and groom to take a horse and carriage to their ceremony, in order to make a grand entrance. Ceremonies would often be held on the beach at sunset to take advantage of the picturesque setting, but avoid the mid-day sweltering hot sun. A Junkanoo Rush-Out, in which musicians would parade through the ceremony wearing costumes with masks and instruments, was a unique way to liven up the solemn vows and celebrate the happy couple. The reception of a Bahamas wedding is where the real party begins. Live music, or tunes spun by an energetic DJ are the norm, and guests dance and party through the night. An open bar features tropical cocktails comprised of rums, juices, and fruity liquors, and typical wedding fare includes rock lobster, deep fried conch, and other spicy seafood dishes. Though there is not a cake that is considered to be the traditional type of wedding cake, coconut is commonly added to the batter or frosting of whatever cake the couple chooses. After a night of dancing and dining in honor of the newlywed couple, wedding guests typically leave home with a party favor of some sort to remember the day. Belarus wedding traditions are quite ancient. One of the oldest wedding traditions involves the concept of order in priority. What this meant was that the oldest daughter was married first, followed by the next oldest and so forth. If a younger sister married before her older sister it was considered a major embarrassment for everyone. In years past, weddings in Belarus (which were arranged by the fathers) typically lasted 3 days, an evening and a half at the bride’s house and an evening and a half at the groom’s house. Even today there is the custom of the bride’s family giving gifts to the groom’s family just before the wedding. In ancient times, although still important to some extent even today, one of the wedding traditions involved a towel. Towels have always been an important element of Belarus culture, with different regions producing towels of different colors and patterns. In days gone by, a woman on her way to the alter would walk to the church with a towel tied around her hand, dragging it behind her on the ground. The path the towel made in the dirt was the path her unmarried friends would follow when they were married. Additionally there was a padnozhnik towel that the bride and groom stood on during the wedding ceremony. The wedding towel marked the pathway the new couple would follow on their journey into a new life together. Following the ceremony the bride would drag this towel around the alter, once again creating a path for her unmarried girlfriends to follow into matrimony. Even today the ceremonial towel plays an important part in a Belarus wedding. Gifts are traditionally wrapped in a towel. More importantly, perhaps, is the symbolic tying of members of the groom’s family to members of the bride’s family using towels symbolizing the uniting of the two families. Wedding towels are treasured and are handed down through generations. Traditionally when a couple in Belgium wishes to announce their marriage, the wedding invitations are printed on two sheets of paper, one from the bride’s family and one sheet from the groom’s family. These wedding invitations symbolize the union of the two families and the partnership of the new union. An ancient Belgium custom that is designed to unite the two families calls for the bride to stop as she walks up the isle and to hand her mother a single flower. The two then embrace. Then, during the recessional, the bride and groom walk to the groom’s mother and the new bride hands her new mother-in-law a single flower and the two of them embrace, symbolizing the bride’s acceptance of her new mother. One of the most important and enduring traditions of the Belgium wedding is for the bride to carry a specially embroidered handkerchief that has her name embroidered on it. After the wedding this handkerchief is framed and hung on the wall in a place of honor. When the next female member of the bride’s family is to be wed, the handkerchief is removed from its frame, the new bride’s name is embroidered onto it, and it is passed down. The wedding handkerchief is passed from generation to generation, and is considered an important family heirloom. The bridesmaids traditionally take up a collection of coins and as the bride and groom exit the church, the bridesmaids toss the coins to the poor outside the church. Giving gifts of money to the poor helps to insure prosperity for the new bride and groom. Following the wedding the bride and groom are off on their honeymoon. In ancient times the honeymoon, which was celebrated by the drinking of mead, or honey wine would last 28 days, one complete cycle of the moon. This was to make sure that the bride’s family did not try to steal their daughter back from her new husband. For the women, traditional dress is required, which means a skirt and blouse, a shawl, and a head covering. One rule the Kgosi (the chief of the tribe who officiates the wedding) would not waive was the requirement that the women sit apart from the men, and on the floor. The men have chairs to sit on, but the women sit on the hard concrete floor. To prove that his love and affection is worthy of the bride, the groom is expected to tame a donkey. If he achieves this successfully, he is trusted to responsibly take care of his future wife. Since the majority of Brazilians are Catholics, it is a must to have the Wedding ceremony in a church. This may take an hour or longer, taking into account the signing of legal documents, readings, poems and other additional dedications. Brazil is just not interested in outfit repeating, it seems! Contrary to popular western culture, it’s actually considered bad luck for Brazilian Bridesmaids to wear the same coloured dress. The brighter, the better! Speaking of Wedding dresses, the bride is expected to write the names of her single friends inside the hem. This is supposed to provide good luck for her gal pals, in the hopes that it might open the doors to their own love life! The Brazilian bride is anything but conventional with her Wedding attire. It is customary for her to sport gold heels underneath her dress. On the Wedding night, which is called a ‘ceremonial’, the groom’s tie is cut up in pieces, each piece auctioned off and sold to the wedding guests. 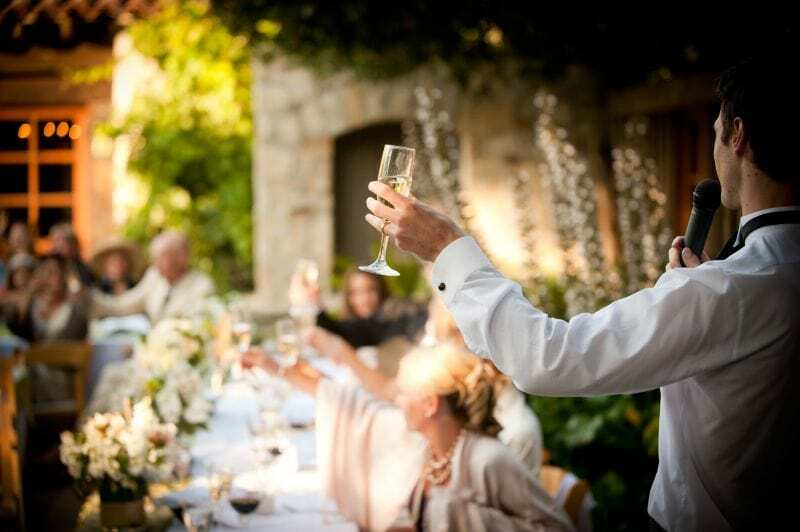 The best man usually leads this ‘auction’, so as to increase funds for the couple’s anticipated honeymoon. Believe it or not, Brazilian brides receive extra crash by taking their shoes off during the ceremonial. The gold heel is placed on the centre of the dance floor, and guests generously drop money into the sole. This quirky custom is done to wish the newlywed’s financial future well and prosperous. A Brazilian sweet, called bem casado (translated to be ‘well-Married’), is handed out to all guests once they leave the reception as a symbol of good luck and prosperity for the newly Wedded couple.